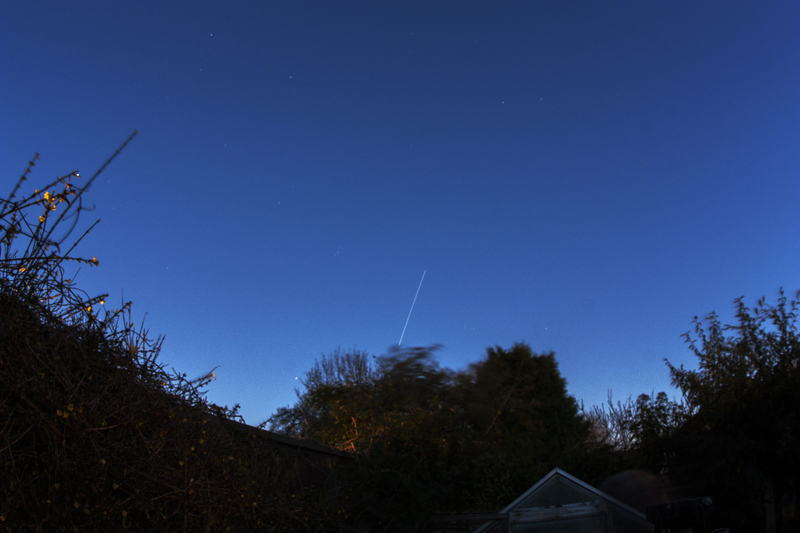 The following two images were taken by Pete Hill and capture an ISS pass over the UK on the 19th December 2014. The first image shows the ISS at the zenith and passing just above the Great Square of Pegasus. The second shows the ISS setting in the east and passing just to the right of the Pleiades and Aldebaran (the latter just peeking out to the left of the trees). Both images were shot using a Canon 450D camera with a Canon 15mm fisheye lens, ISO 400, F10, and 50 second and 35 second exposures respectively. The camera was on a tripod with a remote cable shutter release. The images were shot in RAW and edited in PS 6. Pete also took a 2 minute 24 second video of this pass which may be downloaded here. The video was taken using a Canon Legria FS406 with AWB manual focus and exposure, on a tripod, at 25 frames/sec and edited in Videobrowser SD. 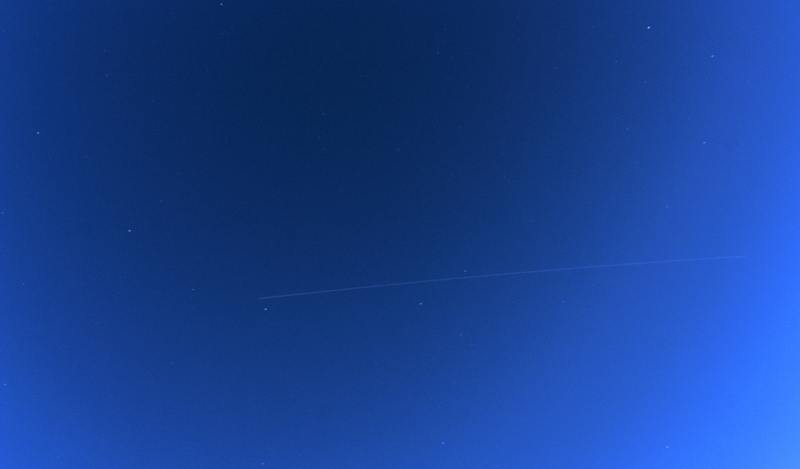 Chris Newsome captured this ISS pass over Porthmadog on the 15th April 2014. He used a Canon 40D, 10mm semi-fisheye lens, and 10x20 second exposures at 400ASA. The lights along the bottom of the image are from Boston Lodge, the engineering depot for the Ffestiniog Railway. Mars is in the lower centre of the image and the glow on the hill is the moon rising.